Born in 1973 in Mexico City, lives and works in Chihuahua. 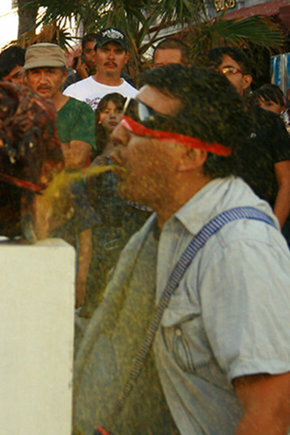 Gustavo Alvarez Lugo, also as known as "Musgus," started as a performance artist in 2000. He immediately began to create actions in urban areas, streets, squares and public transport. Alvarez presents his work both in public space and in art galleries, saying he enjoys and is stimulated by contact with people and groups outside of art institutions. The unexpected encounter swith spectators or "accidental audience" raises his awareness. This is also an extension of the artist's history of performance workshops not only for the art circuit but also outside of the arts community (blind, mentally ill, indigenous, hospice). For five years Gustavo Alvarez have organized the performance art meeting "Performancear o Morir" in the Sierra Tarahumara. Alvarez implements in his work speech performative tools that come from symbolic anthropology, playing with a redefinition of space and using objects and symbols in a typical way of a collective imagination. Allowing to weave an action where "the other" plays an active role leading up to a dialogical process. We can see how his work is permeated by Mexican culture, not by way of folklore, but through objects like wrestler masks, indigenous crafts, folk toys, used as tools to put together a whole exchange process. Intelligently playing with the boundaries between the private and the public, Alvarez creates actions as temporary autonomous zones, in which conventional rules of trade are abolished. This is the first time his work is presented in Sweden. Since 2007, he has led performance workshops in the Sierra Tarahumara with the Rarámuri indigenous peoples, and in the city of Chihuahua in indigenous settlements. Alvarez have participated in festvals and events like Performagia - National festival of performance, Mexico City; International Performance Congress in Valparaiso, Chile; Artist residency Contemporary Center for the Arts at Tou Scene, Stavanger, Norway; 7a * 11d International Festival of Performance Art, Toronto ( 2010) and Infr'Action Venezia 2 (2013). It is the first time that his work is presented in Sweden. Gustavo Alvarez. Ruth. 2011. © Gustavo Alvarez.